Sweetgrass Productions shot their first night segment in Japan five years ago for their film Signatures. Like a lot of night segments, the terrain was low angle and the shots focused on small features. But the seed was planted, and ever since, they've been staring at bigger terrain, wondering how they could light up a huge mountain face riddled with spines in a place like Alaska. This past spring, Sweetgrass' Nick Waggoner, Mike Brown, and Zac Ramras finally realized their night vision. A Swedish creative agency hired them to direct a night-skiing segment with colored lights for Phillips, the electronic company, to promote their new Ambilight technology for home TV theaters. Afterglow is far and away Sweetgrass's largest production thus far. Their budget was just about double that of seminal film Valhalla—keep in mind that Valhalla, winner of last year's Movie of the Year at the 14th Annual Powder Awards, was a two-year project, while Afterglow was filmed in a little over three weeks. 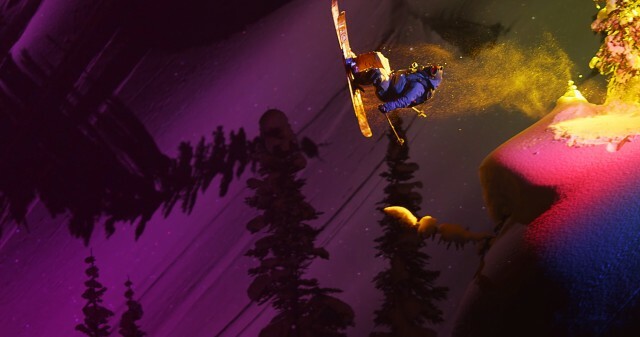 To light up the mountains in British Columbia's Golden Alpine Holidays and Alyeska, Alaska, Sweetgrass had to power 30,000 to 40,000 watts of electricity. For comparison's sake, a household lightbulb contains 60 watts. 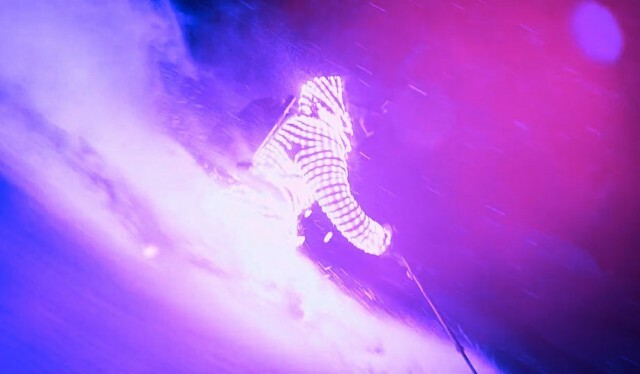 The pscychadelic night segment in Valhalla, which mainly consisted of short pillow shots and backcountry booter airs, required 2,000 watts. Athletes Pep Fujas, Eric Hjorleifson, Chris Benchetler, and Daron Rahlves wore backpacks with LED panels or full light suits. Sweetgrass loaded up helicopters with 9,000 pounds of gear and asked their athletes and crew to pull all-nighters, sometimes requiring them to camp out on top of an exposed Alaskan ridgeline. The process was masochistic, but their self-determination paid off. Once again, Sweetgrass stretched the boundary of ski filmmaking with Afterglow. Today, Sweetgrass Productions released a segment from Afterglow, titled Light Suit. The full film will be released on Sunday, October 19. Nick Waggoner: It was a weird feeling because it was simultaneous excitement and extreme anxiety over all the variables of, you know, is this going to work? How much is it really going to cost us? The whole thing felt on the brink. It was either going to be the coolest thing we've ever shot, or a supreme failure. Mike Brown: Shooting at night on those big faces, it's the epitome of what skiing can be, I think, in the type of filmmaking we do. This was a very rare opportunity to have the resources to do something like this. We just decided to go all in and hope it would work out. Waggoner: We did months of research. Two to three guys, if not four guys, on the phone or sending emails, saying, "Hey, can you call up this weird, eccentric lighting designer in Los Angeles? Can you call up this obscure generator manufacturer in Anchorage? Can you call up this helicopter company?" The list goes on and on. Zac Ramras: You're just reading spec books, basically hoping that this light is actually going to operate in 20-degree weather. Waggoner: We turned the first light on, and it was this crazy, weird obscure light that you'd never know existed. But there's this tiny little company in the East that makes them. Ramras: But you have to source it from Florida, and have it sent to Idaho to have it cross the border, then drive eight hours to the flight launch to get flown in a cargo net. Waggoner: Offhand, it was probably 9,000 to 11,000 pounds of gear. Ramras: The power cords alone were hundreds of pounds because you're trying to span super long distances. Ramras: We were just looking at the heli pilot, just hoping that he doesn't look at our pile of crap like we're crazy, which he did. Waggoner: I knew exactly where I wanted to do this from early on—Golden Alpine Holidays. There was no question in my mind that that was the spot to do it because the terrain is so unreal, it's so close to the lodge, and the snow 95 percent of the time is awesome and stable. Ramras: We had upwards of 10 lights strewn across the mountain in different locations at different angles, pointing at the face we were shooting. Some from the side, some from above, some from a ridge far away. The athletes would either have LED panels on backpacks or full light suits that we would switch on. Waggoner: It's a big 10-foot paddle that you cinematically crank down. Like in the movies. I mean, it's four or five generators that all go on. But it's pretty much just a switch. Brown: In Alaska, we couldn't see snow anywhere. It was pretty tough going. There was basically a thin layer of snow on top of ice… We finally found one zone on this face. It was basically an anomaly, holding some good snow and super north facing. Ultimately, we were only able to shoot four lines out of the whole time we were there in Alaska, out of two weeks. Brown: We'd use the heli to get the gear in place, and for that shoot (in Alaska) the lights were so big they couldn't be moved by hand at all. These were 10,000-watt HMI lights. Once the heli sets them down, they're staying right where they are. Brown: People who were up on the ridge, filming or manning the lights, they were up there all night long. A couple people slept in a plastic garbage bag. Brown: Overall, our style is about bringing people to a world that is really based on imagination and isn't connected to reality, in a sense. We're not trying to interject with athlete titles. We're transporting viewers to a completely different world. When I look at our films, I think that each time we've done that in a new way. Waggoner: From a photographer and filmmaker's perspective, it's kind of what we live for. Those moments of light that are absolutely special. That you know are fleeting and only there for a couple seconds or a couple minutes and that's what ultimately leads you to spend time in the mountains. You're in search of those peak moments. Whether it's the ultra deep powder day that only comes every 20 years or the light that only comes for three seconds every winter.